Lithium-Ion batteries are quickly becoming popular for many UPS applications because of their smaller size and longer life span in comparison to VRLA batteries. Recent innovations in the manufacturing of Lithium-Ion batteries have made them less expensive than they were even a couple of years ago. New safety features have been integrated into the battery modules that have reduced the risk of thermal runaway to virtually impossible. 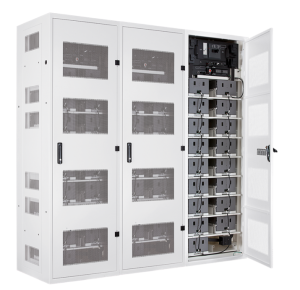 The lower costs and enhanced safety features make Lithium-Ion batteries a practical choice for enterprise 3-Phase UPS applications, especially when considering the reduced operating costs over time. Total cost of ownership analysis has shown maximum savings with runtime requirements of 8 minutes or less. How do Lithium-Ion Batteries compare to VRLA Batteries for enterprise 3-Phase UPS systems? For more information about Li-Ion versus VRLA, click here. The major UPS manufacturers are all expanding their 3-phase UPS product lines to include Lithium-Ion battery options. To review your requirements and determine if Li-ion is appropriate for your application, call me at 800-876-9373 ext. 711, or email, or visit our web site.